Finally, Huddersfield's first EPL win for 2018....Alex Pritchard scoring a neat goal early, couple of assists to Steve Mounie from Aaron Mooy and a late penalty goal from Rajiv Van La Parra....Mooy unfortunately stretchered off around the 75th. minute with a knee brace in place. 2 league wins in a row ....Rajiv Van La Parra and Steve Mounie grabbing the goals for Huddersfield. West ham really are the gift that keeps on giving. Let's hope some life bans are handed out to the idiots at the West Ham game . As much as I don't like the club, the fans have had enough. I was reading a report about the old geezer that planted the flag in the centre circle and one of the comments make me laugh. You have to admire his stamina. It's miles from the stands to the centre circle. You would know a few as well, but some of my mates who are Hammers fans in London are nearly in tears. I love taking the piss out of them normally, but I actually feel sorry for them. Money grabbers, pretending to be fans. At least with the sheikhs and oil barons you know up front that they don't give a toss, it's just a plaything for them. Hated them since the Birmingam days back in 95. Lying port. Hoping they move on to palace next. Millwall up to 7th but still those play off spot are wide open. All the way down to 11th can still make them. Well, that's the title decided and congratulations to Man City, comfortably the best team all year. Mind you, when you've spent over $1,400,000,000 assembling the squad, you'd expect a decent team out of it. All that's required now is for Burnley to overtake Arsenal and Chelsea. With the absolute worst away record in all the leagues for 2018 (zero points) one of those is entirely possible. Who has the best record? PFA team of the year , Kane and Walker the only English players in the XI . What do you care, it's not like you're English anymore or support a team in the premier league - OR DO YOU? Maybe you've changed again. Scrappy win for Spurs against Watford, but at this stage of the season the points are all that matters. Big night next Monday (why do we have to have Monday night games - bloody ridiculous?) and strangely, I think any result suits Spurs. Down at the bottom end, I can't see Huddersfield or West Ham getting any more points, but neither can I see both Swansea and Southampton getting to 35 points and their game against each other will decide who goes and who stays. Ideally West Ham would get relegated on goal difference! Swansea v Southampton 0-1 this morning in the big relegation battle. As a result West Brom go down. Lots of long ball after long ball when it’s do-or-die like this, with tackles flying in. No wonder shin-pads are mandatory these days. 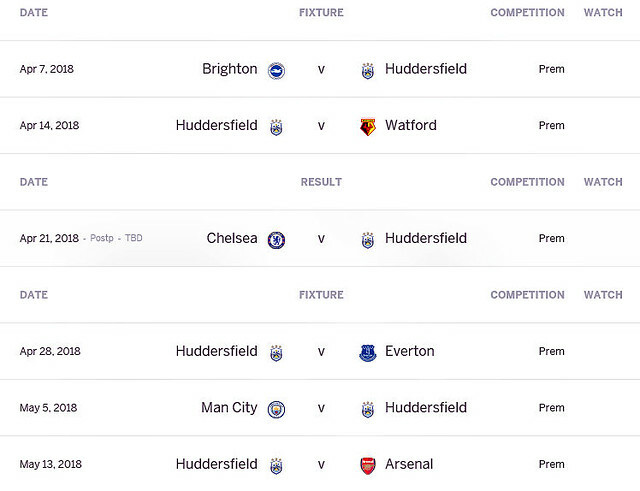 Worrying for Aaron Mooy and Huddersfield that they may still be drawn down into the vortex. Huddersfield need to salvage at least one point from their 2 games....if they don't and Swansea defeat Stoke then Town's worse goal difference will see them relegated. Mind you, I never thought Town would salvage a point away at Manchester city. Can't envisage Swansea beating anyone at the moment, I reckon you'll get away with it and go down next season. Huddersfield safe. That team from Wales (Swansea) down. Liverpool won’t lose at home. All critical positions settled, so might not stay up until 11.30pm to watch the final round this Sunday. How did the Arsenal go? We don't play them until the weekend. I hear the Arkaba was going to show it too. Not that well in a game that didn’t matter. Arsenal’s finale after the let-down in Madrid was the magnificent 5-0 against Burnley and the terrific home farewell for Professor Wenger. I might still watch the last game @ Huddersfield this Sunday. A bit worried about Mooy’s plodding performance this morning at Chelsea. He doesn’t even jog back when he loses the ball. Injured? If so, doesn’t sound good for the Socceroos. ps Not Nice, meant to ask - what to make of Pochettino’s hint that he’s gonna ask Levy & friends for more squad money & especially the comment “or any other” (manager) that follows him will have to do same? ....what to make of Pochettino’s hint that he’s gonna ask Levy & friends for more squad money & especially the comment “or any other” (manager) that follows him will have to do same? I can't think of a single manager, especially in the PL, that won't be asking for more money for transfers and I'm sure, if the opportunity to manage Barca or Real was offered to Poch, that he'd ask to be released. No manager lasts forever, but I think the good ones (think Shankly, Ferguson and even Wenger) leave a legacy mentality that carries the club forward for many years after they leave.